This article belongs to War Inc theme. The Battle of El Alamein was one of the great battles of World War 2. For about fifteen terrible minutes the weapons thundered. Then suddenly, far to the east, two searchlights flashed into the sky like a celestial sign and remained stationary. When darkness came, the men of the 2nd 43rd Battalion ' part of the 24th Brigade in the Australian Ninth Division- were sucking in air. It was electric with anticipation. A golden moon climbed through the fast dwindling storm clouds revealing the shadowy figures of Montgomery's Eight Army moving around nervously and watching the activity. The silence that usually marked the night didn't come. Fighting vehicles moved to their battle positions and caused a low throbbing hum. At 21:00 hours, the noise ceased, and in the silence, the diggers felt the tension as men shook hands with their fellow men knowing what was about to happen. The battle for the Middle East had come down this one final battle. 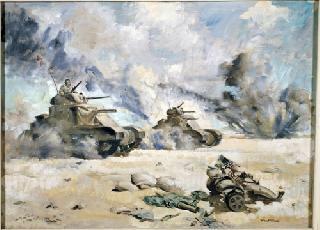 At precisely 21:40 hours, on October 23rd 1942 the second Battle of El Alamein began. 'Fire! Fire! Fire!' screamed over and over broke the stillness of the night. Artillery of the 8th Army crashed into action with a terrifying earth-shaking roar. A wall of flashing lights and an exultant shriek turned into a long malignant howl that rose and rose into a rampant ferocity that echoed from the coast to the Qattara Depression as over nine hundred guns stabbed the air with livid flame. The night was vibrant with dancing flashes and roaring guns. The roar of heavy artillery, with the screech of shells and the base booms from heavy ordnance filled the night. The soldiers were stunned as the sound, flashing lights, and vibrating earth made their existence seem insignificant. An ugly crump filtered back after a minute of firing with a red angry smudge rising from the enemy gun line and ammunition dumps. For about fifteen terrible minutes the weapons thundered. Then suddenly, far to the east, two searchlights flashed into the sky like a celestial sign and remained stationary. The guns ceased firing. The darkness and the abnormal silence were more terrifying than the noise. It felt like everybody on earth had died. Yellow cordite mingled with stirred up dust and ghostly figures floated past the watchers. Five long-drawn out minutes passed. The whole world held its breath. The searchlights waved and crossed. Scarlet flame stabbed into the grey night like a thousand angry dragons. The barrage seemed even more ferocious then the first one. At zero hour red signal flares hissed illuminating the waiting army in a lurid light like ghostly apparitions. The rumbling of hundreds of tanks and the rattle from equipment of thousands of foot soldiers filled the silence left by the now soundless guns. They loomed out of the red light into the moon glow like messengers from Hell. Overhead a continuous stream of angry red and white tracer from two Bofors guns marked the line of advance. 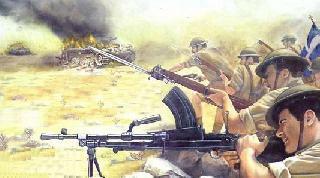 A Bren gun carrier approached Tel el Eisa; a column of grim faced diggers ran through the 2/43rd Battalion's lines. Vehicles pulling six pounder guns followed. German artillery roared in and smashed into a tank. A sheet of flame shot into the sky leaving a great steaming brown hole and the tank a blackened pile of metal. One wheel wobbled off into the darkness. No survivors emerged from the tank. More shells landed but other than shrapnel damage, there were no more direct hits. Mortars with smaller but more accurate detonations blistered around the advancing Australians and joined crashing enemy artillery. The 18th Platoon of the 2/43rd Battalion moved forward to raid Kilo 110 north of the railway line. Small arms fire and the nasty purr of machine guns were ahead. An engineer waved them down to show where he had cleared a path through a minefield. Through the field, the carrier's armour sang as bullets cannoned into it. Fearful enemy wounded were trying to attend to their wounds. One was placing a bandage on a bloody seared stump that was once his arm. Some were crying out in pain, others were sitting stoically staring at the Australians, who were too busy to care. The man with the severed arm tried to run and a digger shot him in the back. He sank to his knees like a priest in prayer and then collapsed on the ground and kicked for a few minutes then lay still. Five glum prisoners sat with their hands on their heads. Engineers arrived and set charges in an enemy anti-tank gun. The gun exploded with a roar, lifted into the air and settled back with the breech blown out. The rumble of tracks and an enormous shape lurched out of the gloom into the red light of a distress flare, its huge cannon swinging from side to side like the snout of a prehistoric beast. It seemed to fill the entire world. An Allied tank moved into its path. A scarlet flash and the crash of the German gun firing into the British tank sent flame shooting high into the air and lit up the battlefield for a moment. Kev's ears rang and for a few moments, he couldn't hear. Two of the British crew ran from the tank but German tank machine guns sent them crashing into the dirt like broken dolls. The tank's heavy machine gun raked the area, a digger was almost cut in two only three yards from the carrier. The carrier's armour sounded like the battering machine gun was chewing it up. The Platoon Commander stood and signalled withdrawal. A bullet hit him high on the chest; he spun around and crashed to the ground. The carrier raced for the gap in the wire. The Germans only had small arms. Their riflemen had good cover and were close to the gap where they spread out. One of them stood and threw a grenade. The grenade bounced off the armour. The carrier was well away when the grenade exploded with a rush of air splattering the Australians with shrapnel. They left the attack behind them, and slowed for the minefield. They found some of the retreating 18th Platoon's diggers struggling with wounded. Some were placed across the carrier and with six diggers walking; they took the injured soldiers to a field hospital. Other platoons were already back and there was talk about how other units had fared. The whistle of an artillery shell forced them to dive behind sand bags. They stayed there for four hours while the enemy pounded the Australian lines. Over the next few days, life was comparatively quiet. Other than the occasional artillery barrage, the enemy was occupied elsewhere. Teams of allied bombers; they called the 'Football Team', make regular sorties against the enemy. It took another few days of fierce fighting until the enemy was gone, except for some German Bombers. The battle of El Alamein was won. Research The 2nd 43rd by Combe, Ligertwood and Gilchist.